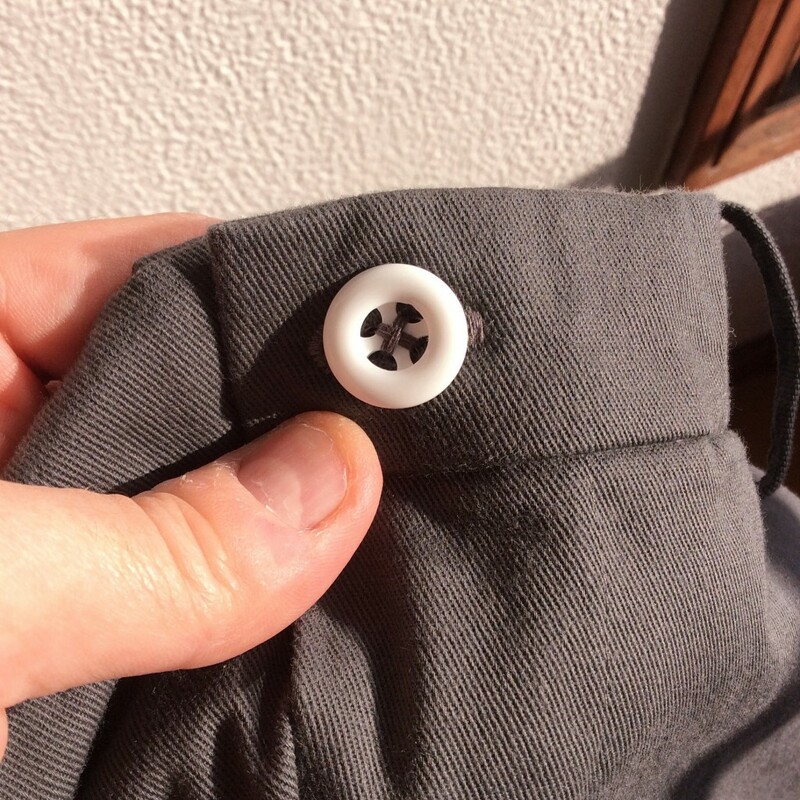 Originally this article was going to be the conclusion in the Pants series – the wearable muslin is completed and I’ve actually worn it out into the real world. But there’s so much to talk about in terms of construction and evaluation, that I’m going to split it into two parts. Today’s article will cover the construction aspects; tomorrow we’ll look at the finished result and talk about how it went. I pretty much followed the construction techniques detailed by David Coffin in his book Making Trousers, and his Craftsy class Pant Construction Techniques, in the Details. Any construction issues are my fault, not his! 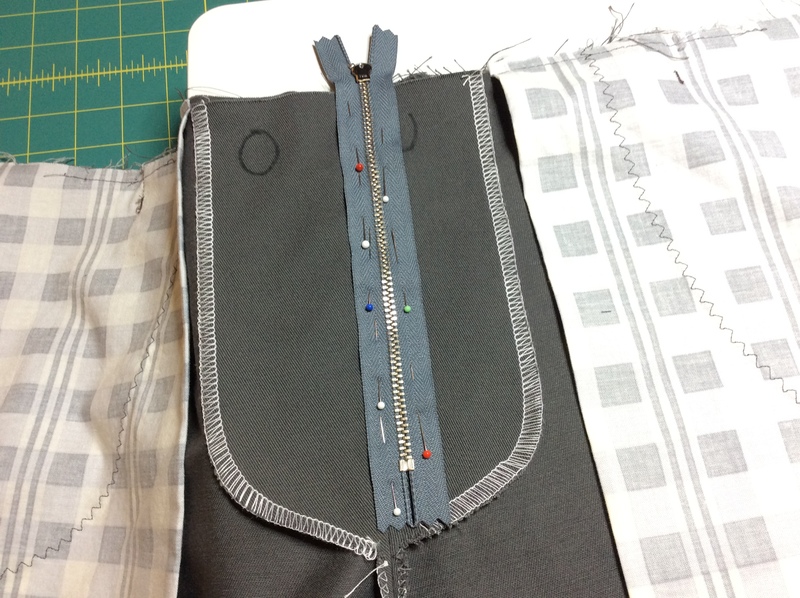 Part of my inspiration for the pockets on this wearable muslin is Bonobos pants, with welt pockets which skip the pocket facings and let the pocketing fabric be a design element. I went one step further. I seem to be fascinated by the juxtaposition of white against gray and black – my first experiment with this was the White and Black Hoodie. So I chose a white fabric for the welts themselves, to see what happens when the welts ‘pop’ against the gray fashion fabric. 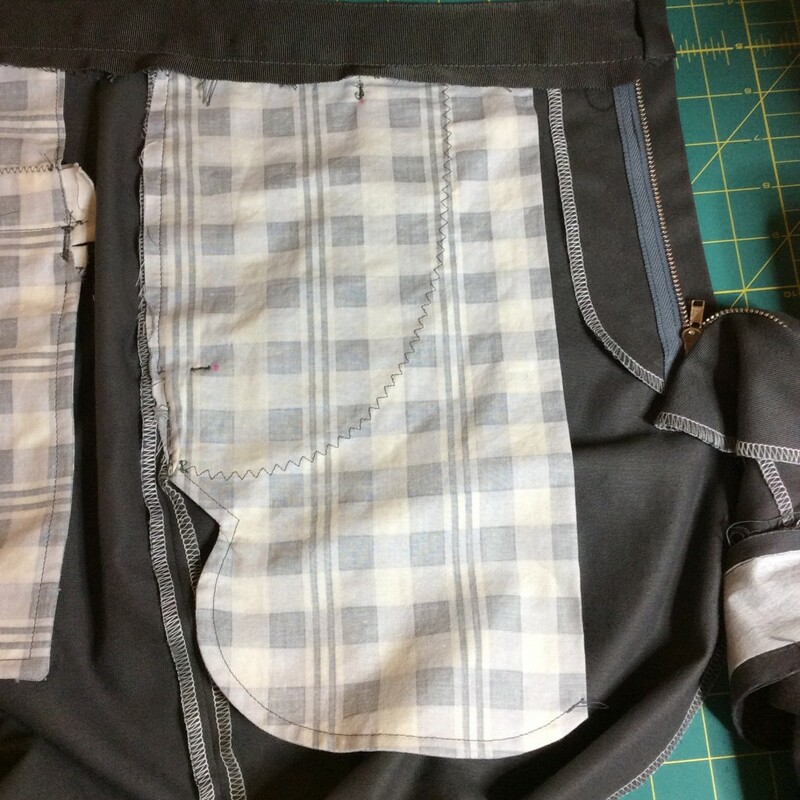 And I used a pocketing fabric with a gray plaid to harmonize with the whole thing. 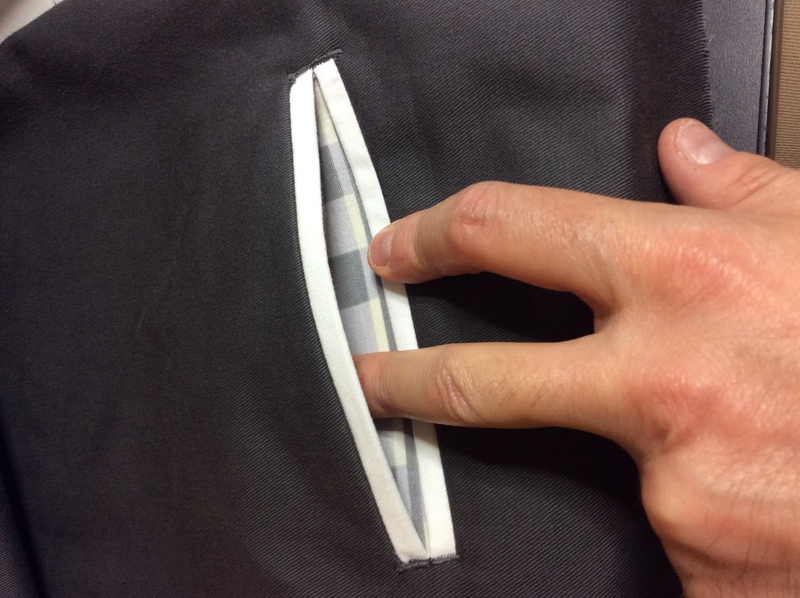 The white welt fabric is a cotton weave – broadcloth? poplin? I can’t quite tell – which is a little drapier than quiliting fabric. I interfaced the welts to give them some body to help the welts fold crisply and to help them keep their shape. Interfacing the welts was a good idea; attaching the welts backwards was not. I had them all stitched in place before I realized that interfacing faced outward once the welts were turned. This meant I had to pull all the welt stitching out, after I had already cut the slits for the welt. I did my best to match welts to the cut areas when reattaching them, but by this point any hope for welts with perfect corners was lost. Here’s the results of my rescue job on both welts. 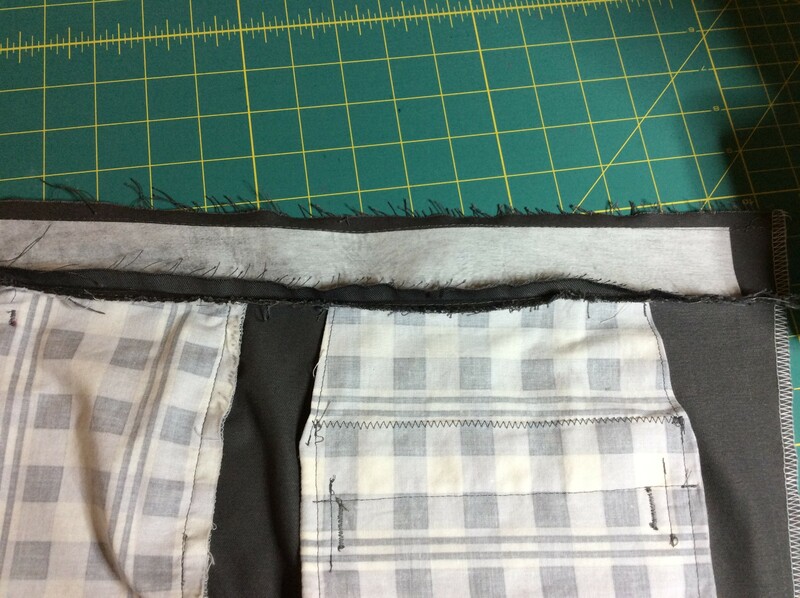 Both front and back pocket bags were finished with french seams. 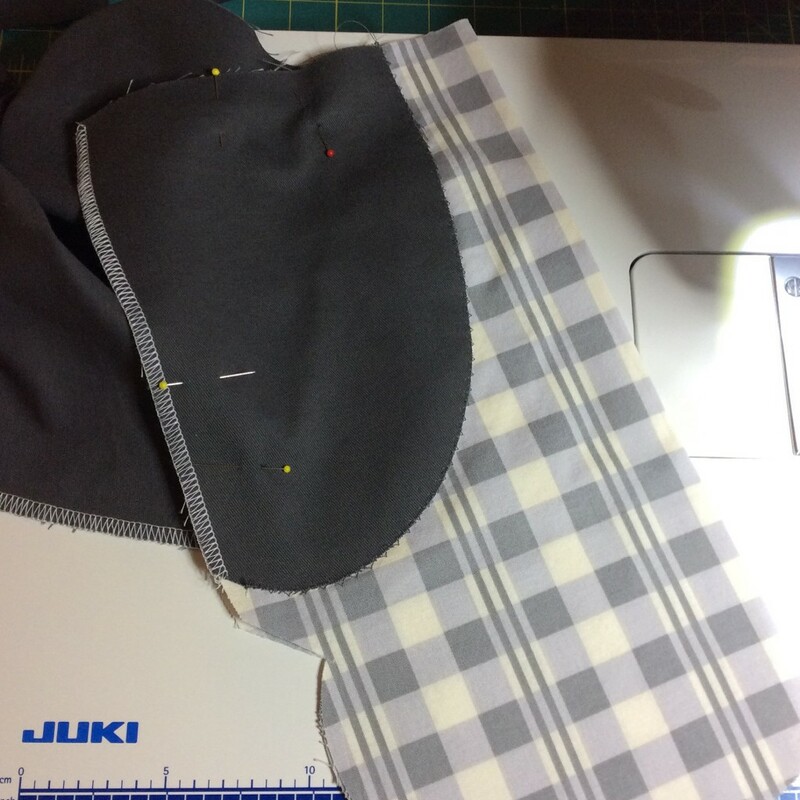 The plaid design for the right pocket turned out a bit off-kilter, because I put in the right pocketing a little bit free-form and I should have paid more attention. But overall I’m happy with them. 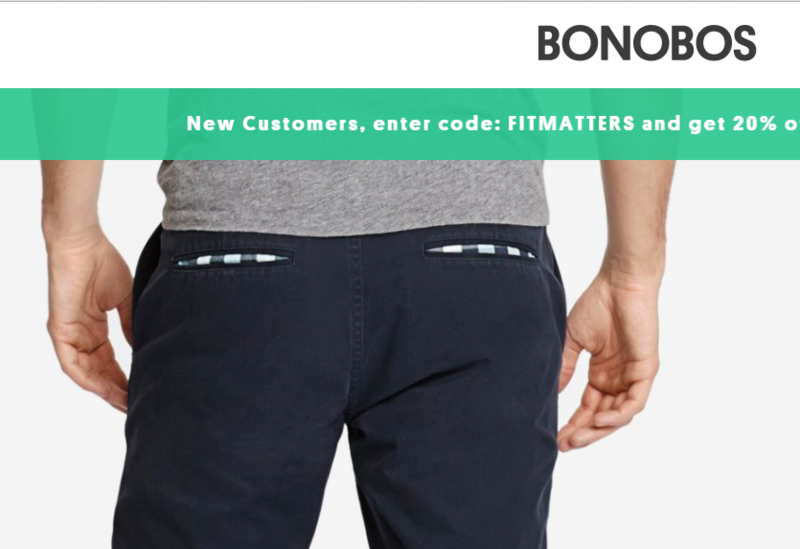 I followed the Bonobos approach of leaving off the inside pocket facing. 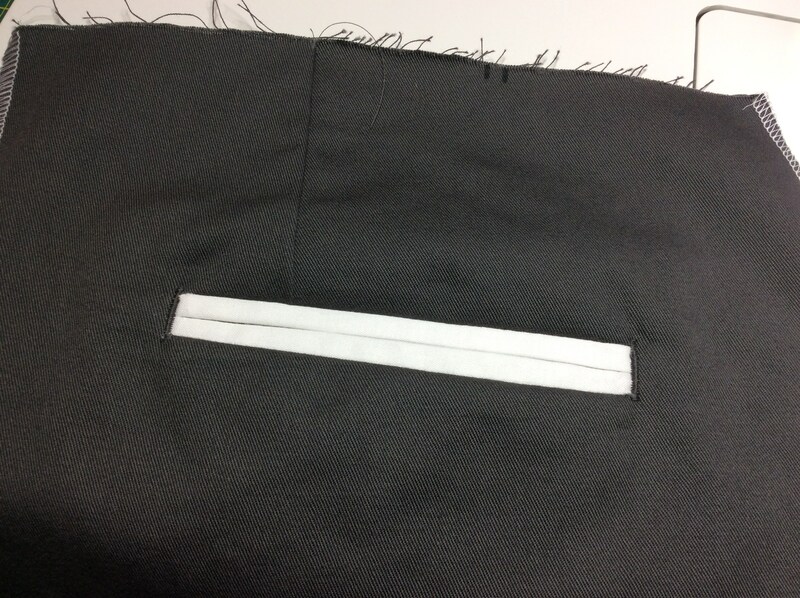 I also chose to understitch the lining to the pocket, rather than topstitch the lining into place. 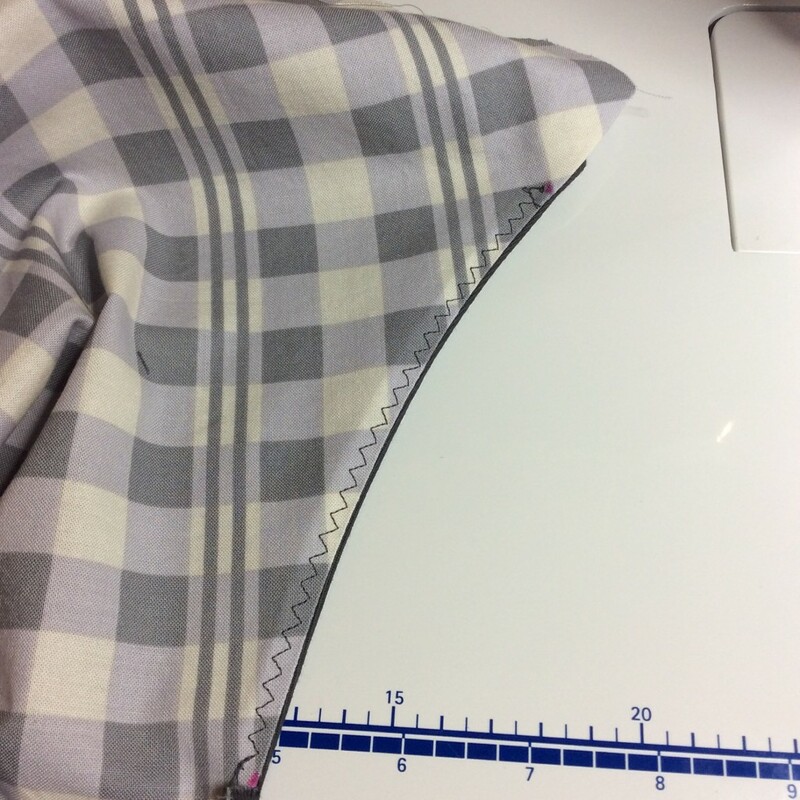 Nancy Zieman recommends a three-step zigzag stitch when understitching, which helps the fabric lie flat. It’s interesting but visible in the finished pants. I’m going to act like it’s a design feature. Here’s the understitching from the other side of the seam. 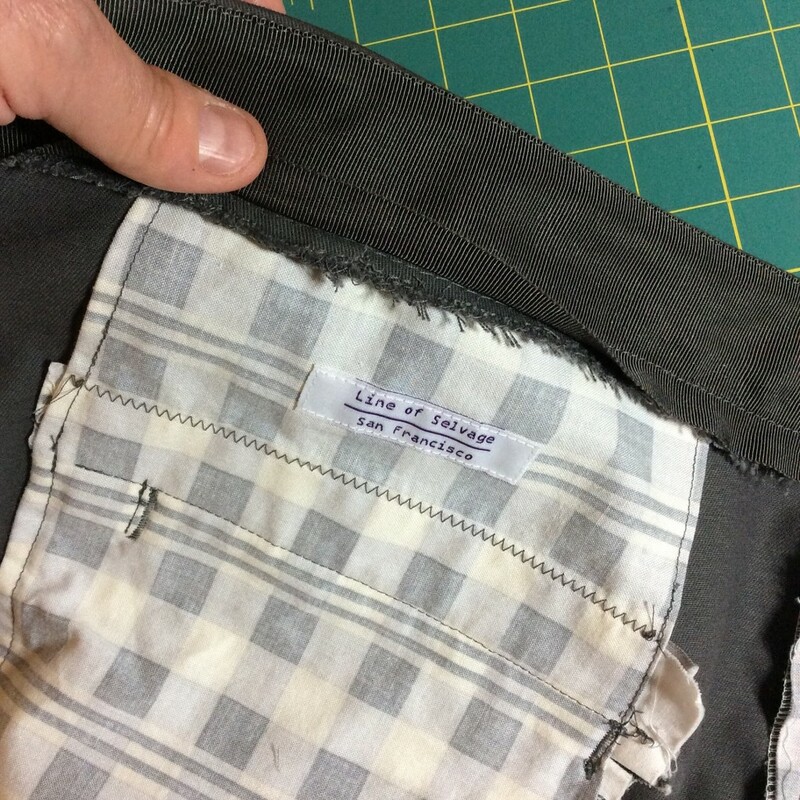 The finished pockets are french-seamed, anchored to the side seam by stitching in the ditch along the side seam from the outside. I went a litlle off-script from the order DPC constructs the pockets. 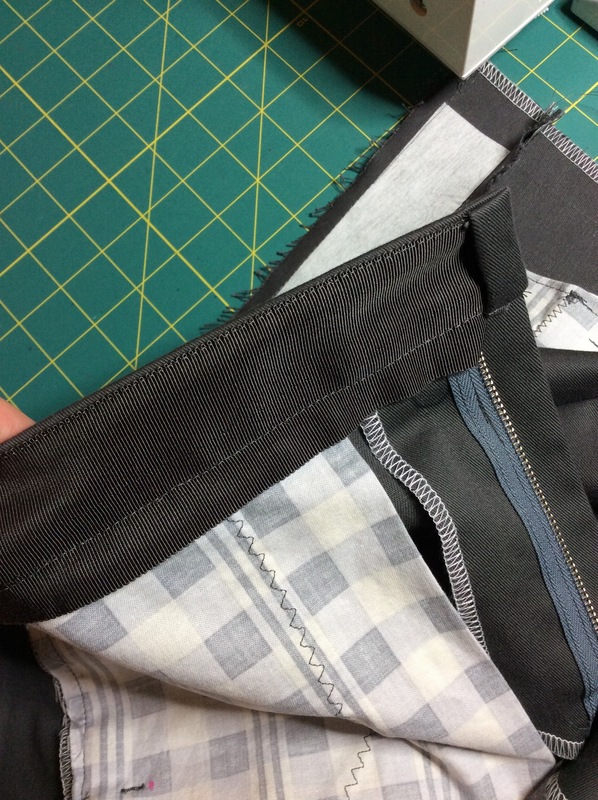 My method would have worked better to simply catch the pocket bag while sewing the side seam, like I have done in prior pants-making projects. 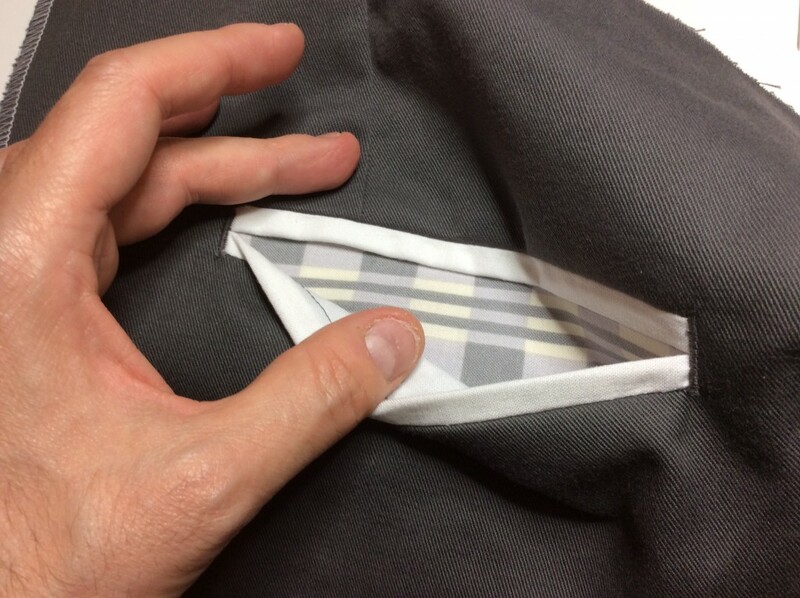 But my references – DPC and Roberto Cabrera’s tailoring book – recommend anchoring the side pocket this way. I had to undo some of the pocket seam, and so you can see there’s a bit of a mess at the lowest bit where pocket meets side seam. 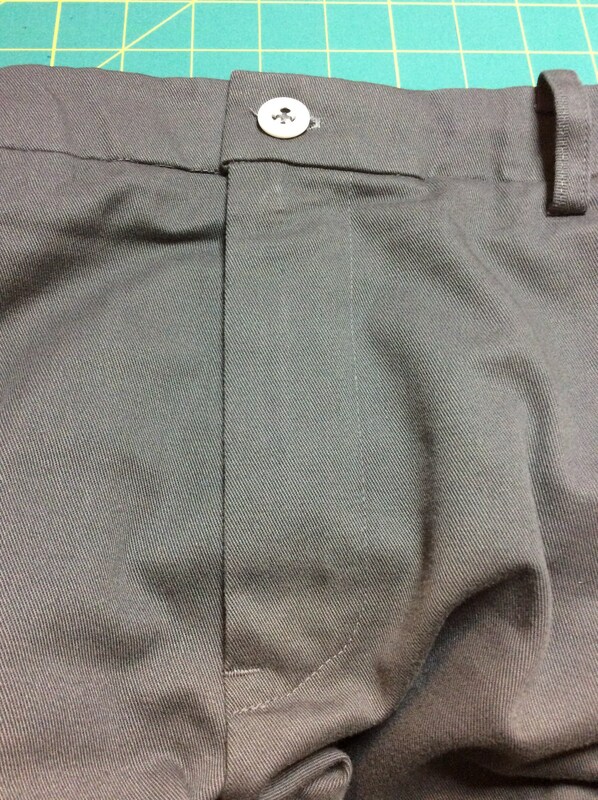 Here’s a view of the front pockets from the outside. The openings are anchored with bartacks. The side seam is wavy; it is I think a result of being cut slightly on bias and looks better when worn. There’s also some stitch-in-ditch at the waistband right at the side seam that’s off, and I fixed by redoing the waistband. The zipper fly went in without incident. This time I got the overlap and underlap sides correctly identified; I marked them “O” and “U” to avoid confusion. I put in the zipper with the teeth about a centimeter in from the center front line so they would be inset somewhat in the final product. 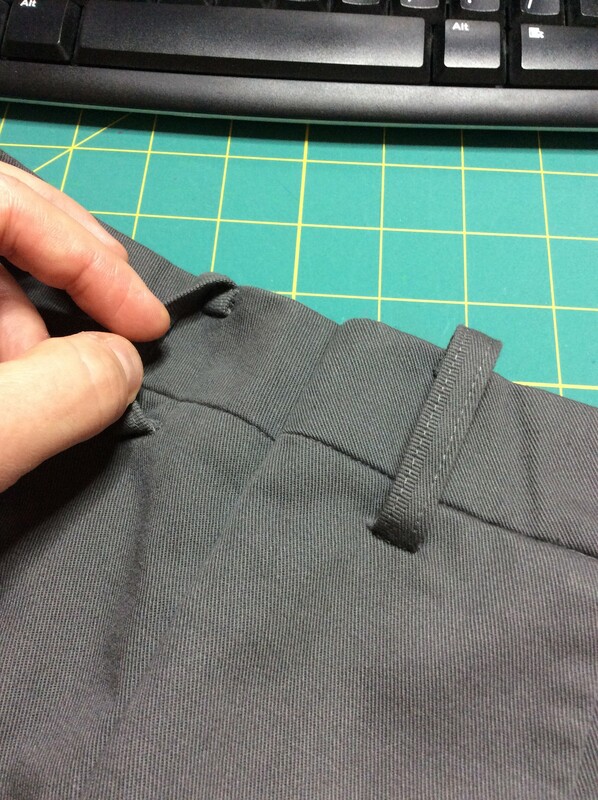 Waistbands are my least favorite part of making pants. 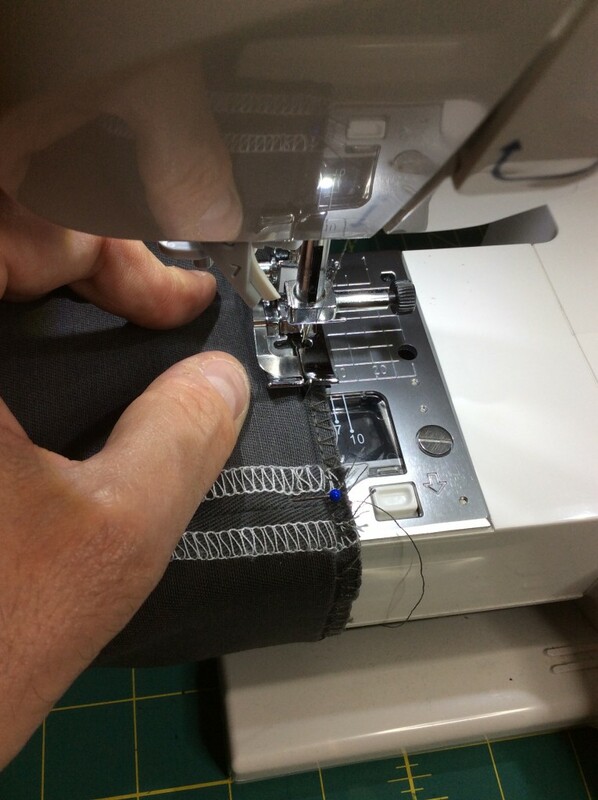 To me, they aren’t any less difficult than other parts of the pant, and when you’re done you have completed one of the least interesting features of the garment. And then you have belt loops to worry about. I decided to try David Coffin’s suggestion to use Petersham ribbon as the pants lining. I found 2-inch wide Petersham at Britex Fabrics, where I was schooled by the sales person about how Petersham differs from Grosgrain ribbon in general, and how to use it. Petersham is part of the grosgrain ribbon family, but not all grosgrain ribbons are Petersham. All grosgrain ribbons are woven with a distinctive ribbed structure, but only Petersham ribbon has a special undulating selvage at the edges. 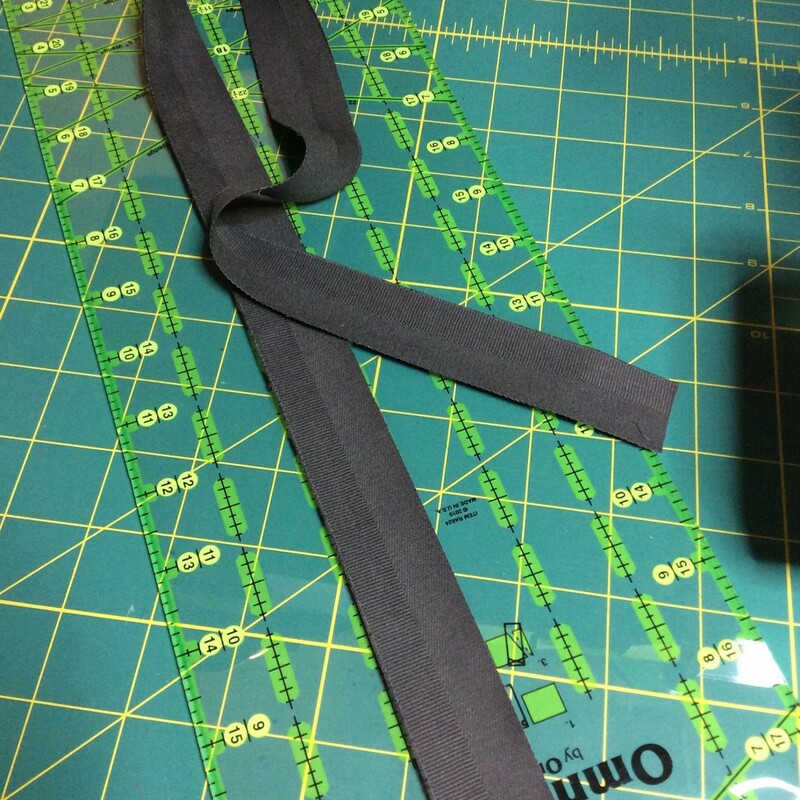 I bought a small sample of regular grosgrain ribbon just for this blog post so you can see the difference. Here’s real petersham. Look at the little “U”-shaped loops on the selvage. And here’s a grosgrain ribbon that is not Petersham. Look at the flat selvage. The selvages on Petersham are important, because it allows the weave to expand, so the ribbon can be shaped. 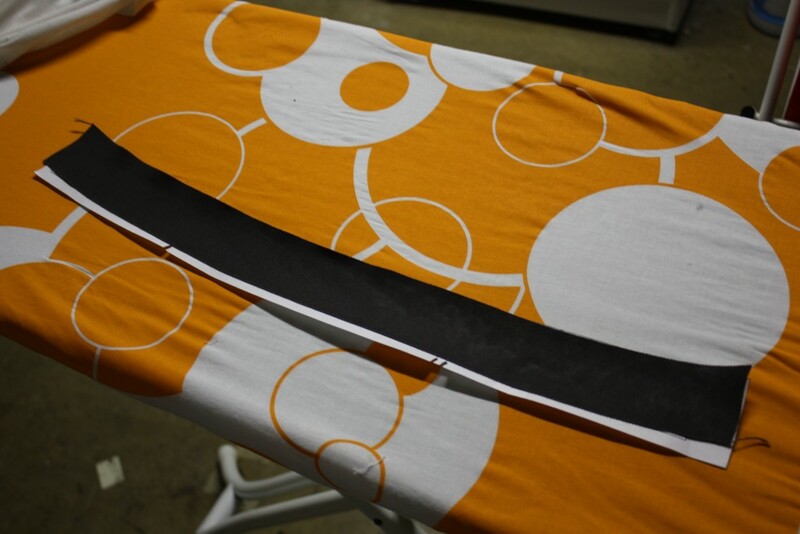 Here’s a piece of Petersham that I shaped to match the contours of the waistband pattern piece. I was told to use a low heat (I used the lowest heat setting on my iron), and to gently shape the ribbon by pressing with the iron while tugging the ribbon. I made an error with my pattern draft for the waistband – it was too short for the construction method that DPC uses to attach the Petersham. In this photo, the waistband should have folded back as far as the fly shield, but it’s only just long enough to wrap around center front. Since that’s exactly where the buttonhole should go, I decided I had to fix it. So I ripped off both waistbands and redid them from scratch, starting with a revised, elongated waistband pattern in Wild Ginger. To construct the waistband, first the waistband piece is sewn to the pants. 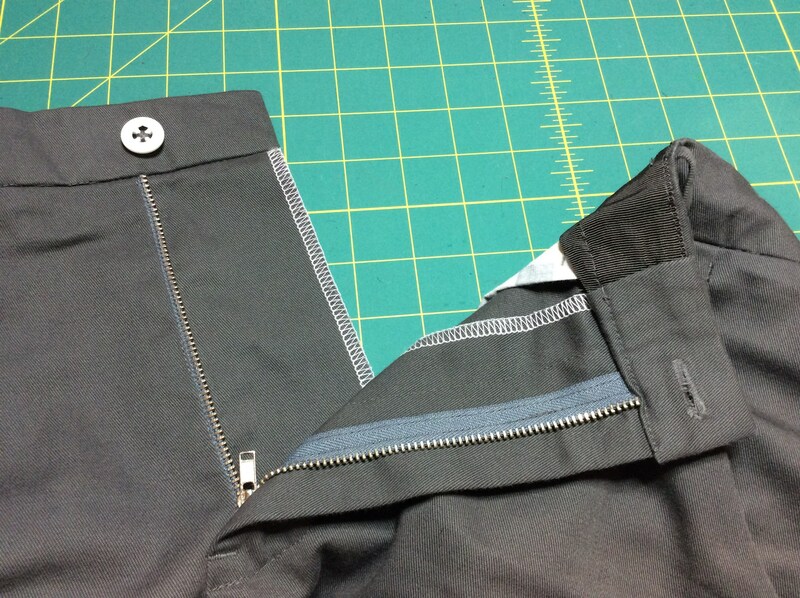 The waistband is pressed up, edge folded over center front, and the Petersham is stitched to the top of the waistband. 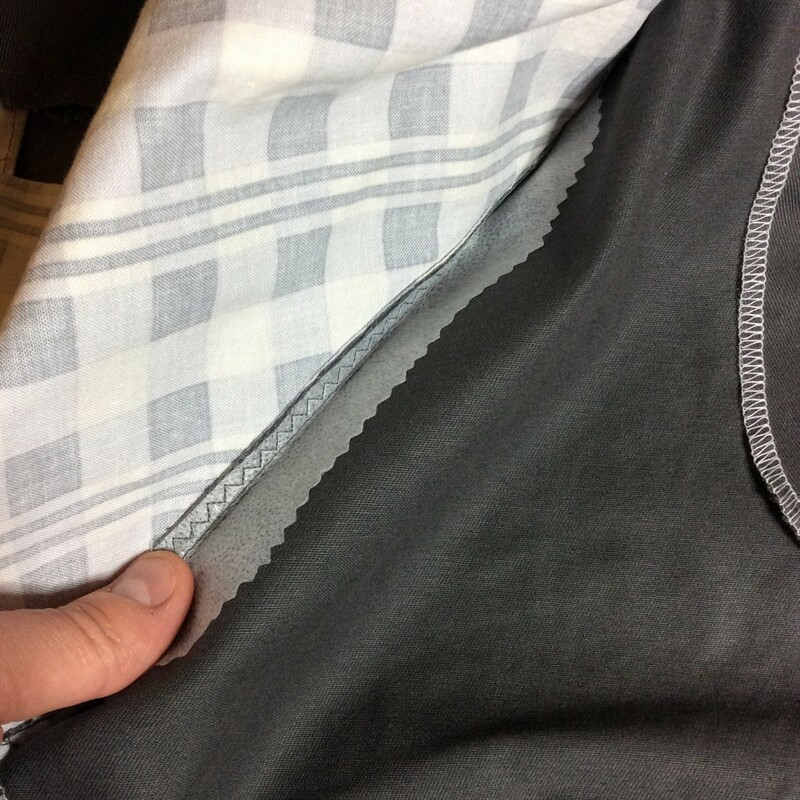 I put down a line of machine basting right at the fold line for the top waistband so that I could position the Petersham accurately. 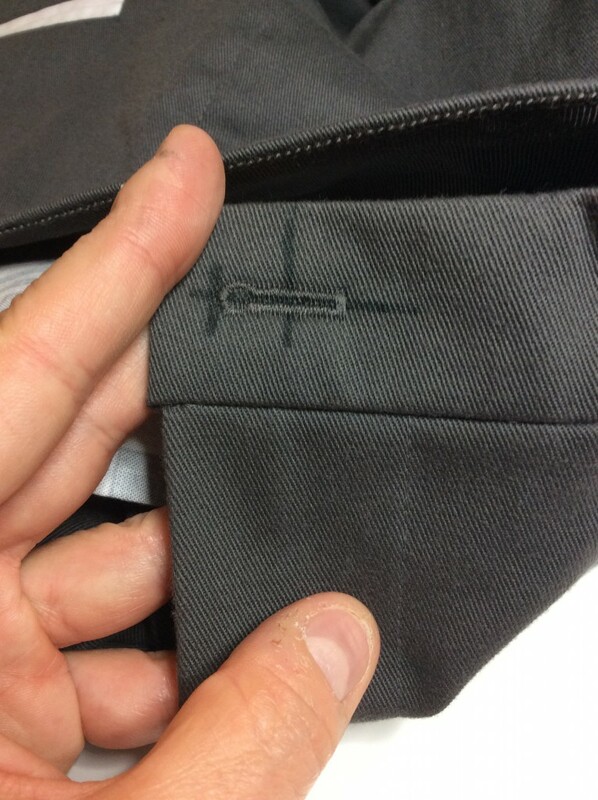 Here is how the waistband looks after the Petersham is attached. 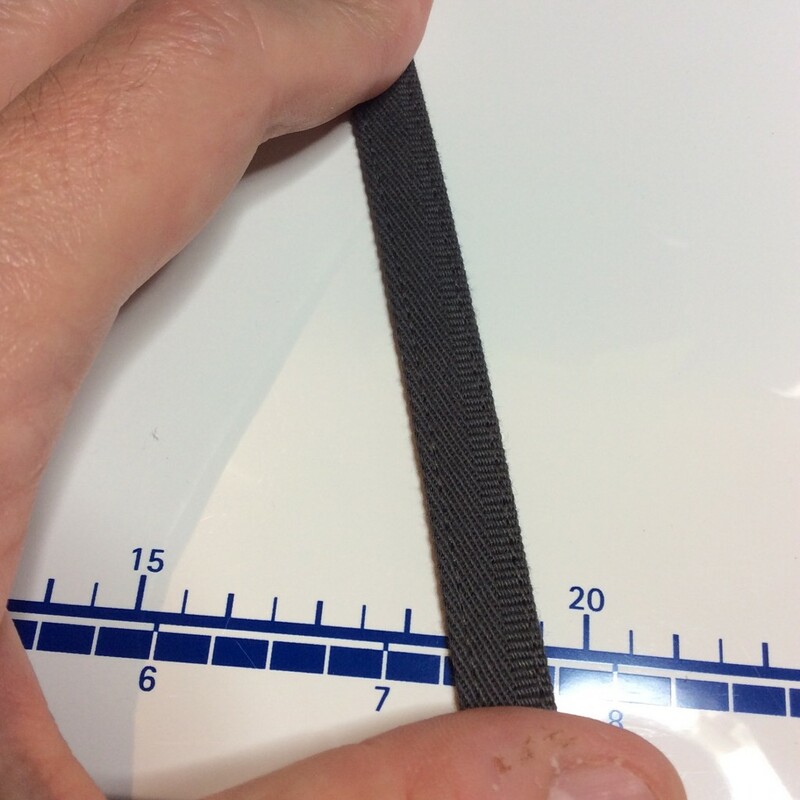 At this point, you turn the waistband (I used hemostats as a turning tool just as DPC does in his books and videos), and voila – a waistband corner. 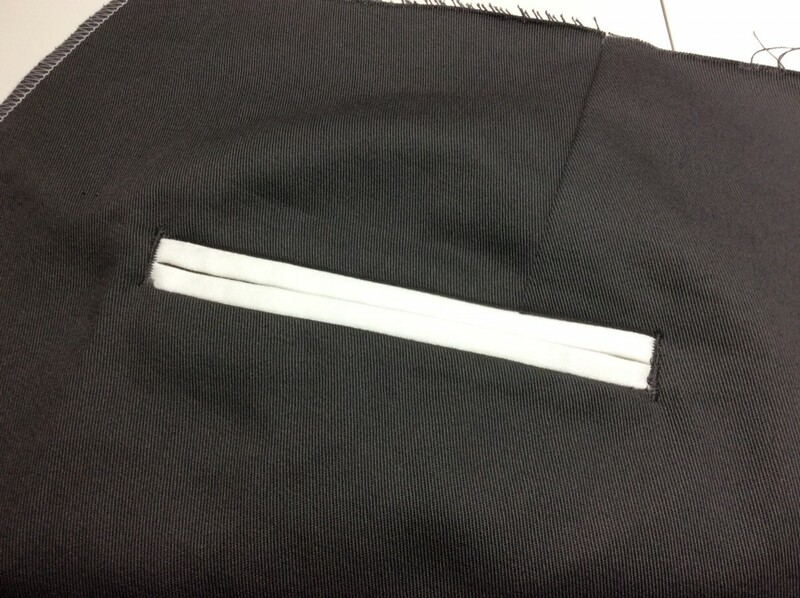 I machine-stitched a keyhole buttonhole. 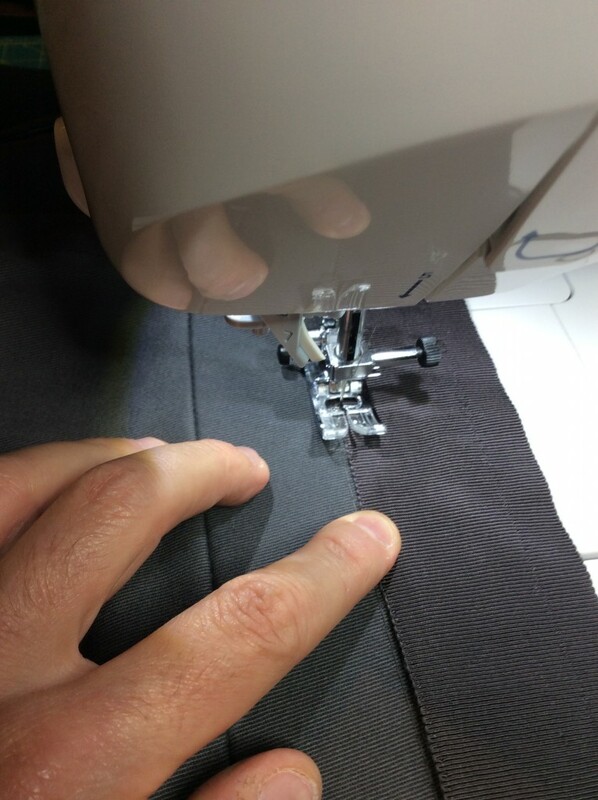 The electronically-sensed Killer Buttonhole Foot of Death on my Juki F600 stitched the buttonhole through several layers of fabric, interfacing and Petersham without problems or complaints. The front button came from Maya “the Button Lady” at Britex Fabrics. I attached it by hand. 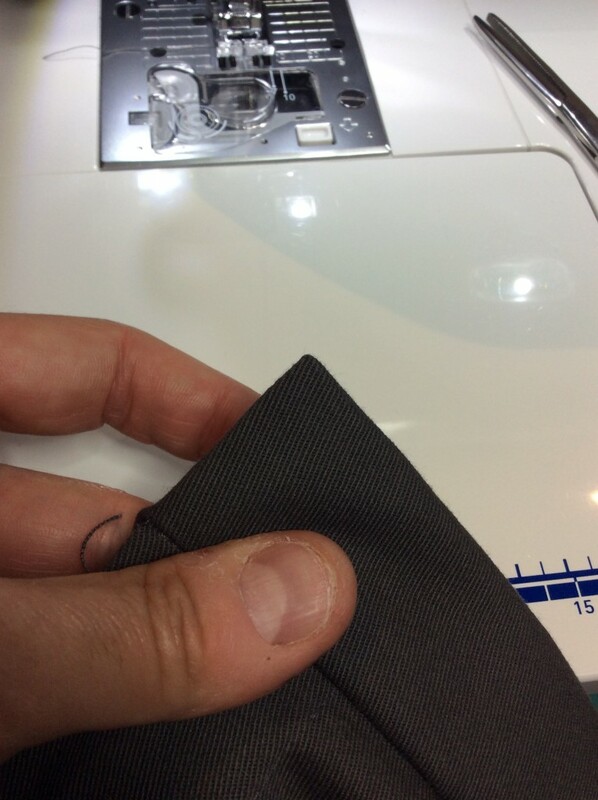 I folded down the pants side of the waistband seam allowance, rather than folding it up into the waistband. I finished the seam allowance with an overcast stitch on the machine, but it still looks a bit ragged and even though it is covered by the Petersham, I wish I had finished it with the serger like I did elsewhere. 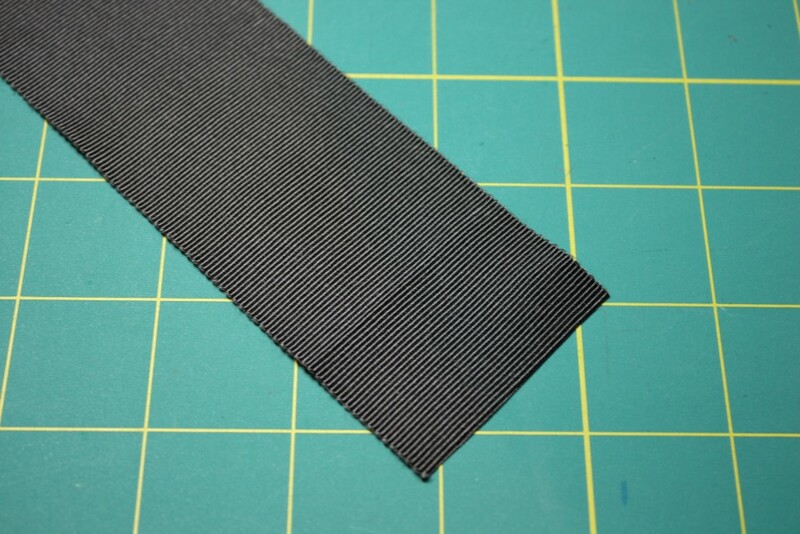 The belt loops were made with a strip of fabric, cut along the fabric selvage (the ribbed bit in the photo). After a 3-way fold and topstitching, the selvage made a bit of a design detail in the outward facing part of the belt loop. I followed this tutorial for attaching the belt loops. I think I found this from David Coffin, either on one of his Pinterest boards or in his Craftsy class. 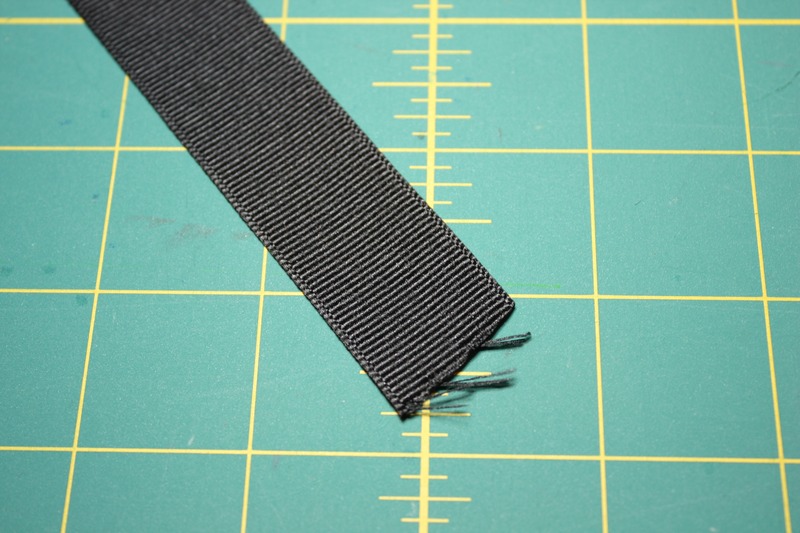 The nice thing about this method is that the raw ends of the belt loops are fully enclosed, but it does require a little more work at the machine. 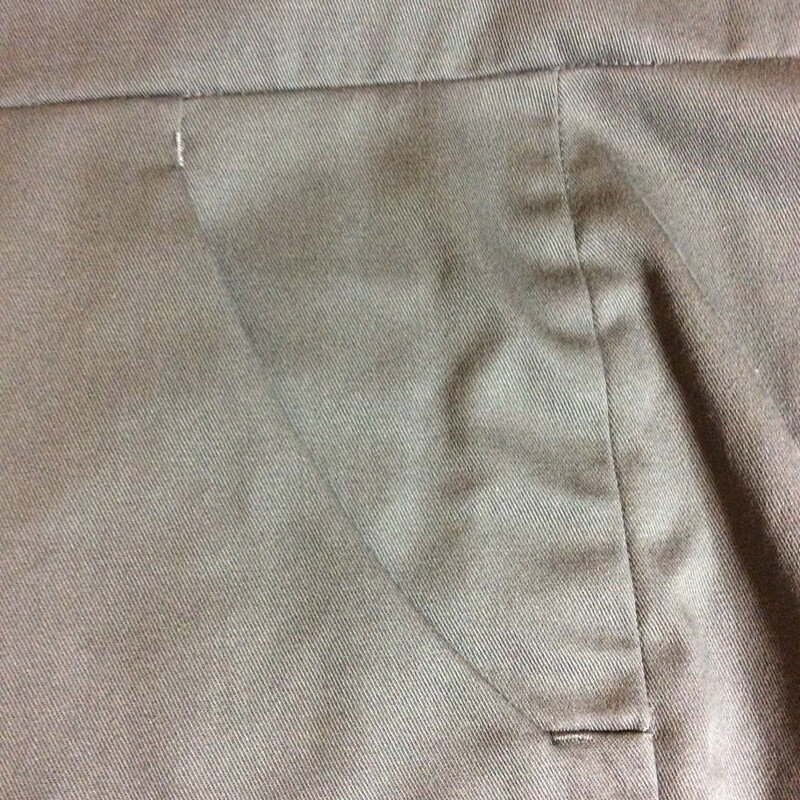 I set a narrow-width zigzag stitch and set the stitch length short, but not as short as a full satin stitch. I used a pair of Levi Dockers city pants as a model for the length and width of the loops, but I think they came out too large and would definitely make the loops smaller on my next project. I had never done a blind hem before, and at every point I’ve chosen against visible stitching on the outside of the garment. So I tried a blind-stitch hem for the very first time. This turned out well, except for two spots around the inside seam allowance where the blind stitch didn’t catch the fabric and I had to go in to patch it up. You can see me approaching one of those pesky side seams in the photo below. This entry was posted in Trousers on October 12, 2015 by mportuesisf. Love these details! 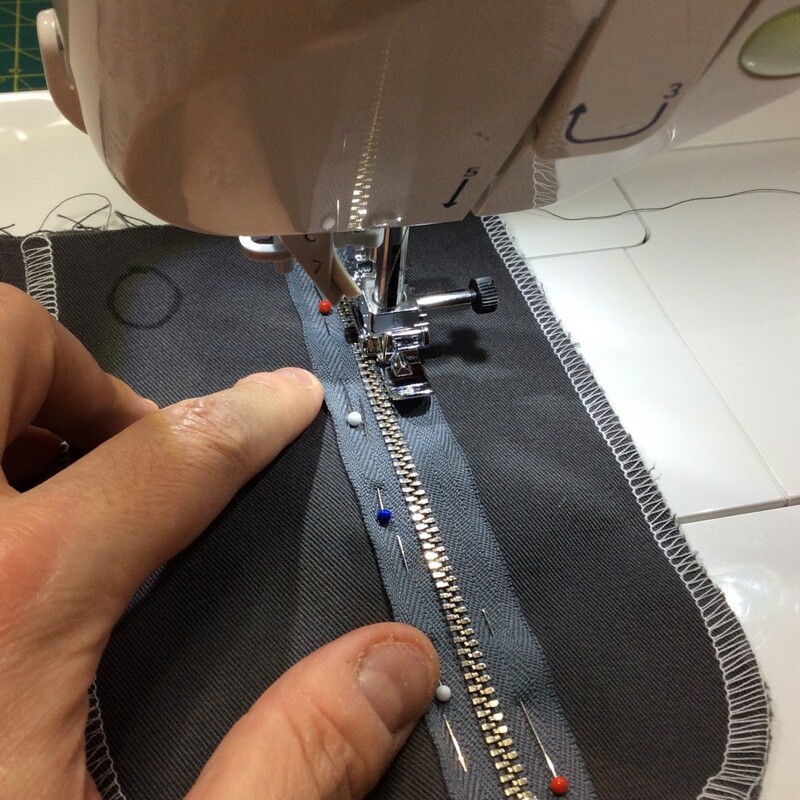 I have been following along with your whole adventure and can’t wait for your next post with the finished pants! I think your “save” on the welt pockets is brilliant. Trust me, only you will ever notice any imperfection. Also, I’m so glad to hear that someone else hates putting on the waistband as much as I do! Wow! Your attention to detail is amazing. Those pesky welt pockets do make a person want to curse. Thank you for taking the time to share with us. Great work. Love the waisband with petersham. I must get some while here. Last year I went all out calling people in Hawaii to ask about it no one knew. As usual I had a bit of trouble explaining. Belt loops!!! I gave up on them… Now you inspire me to try them again. Welt pockets, maybe soon. Thanks for sharing. Big reveal coming soon? Yes, I am fortunate that I live near Britex Fabrics (in fact, I can pop out to visit them over lunch while at work) so hard-to-find items generally aren’t difficult for me. The labels came from Wunderlabel.com. They were called LabelsAndRibbon.com when I ordered from them, but have changed their name since then. You can customize text, font, colors and add a symbol if you like. I got the sew-on type and used the “OCR” font for my label. Thanks so much for the mention of wunderlabel. 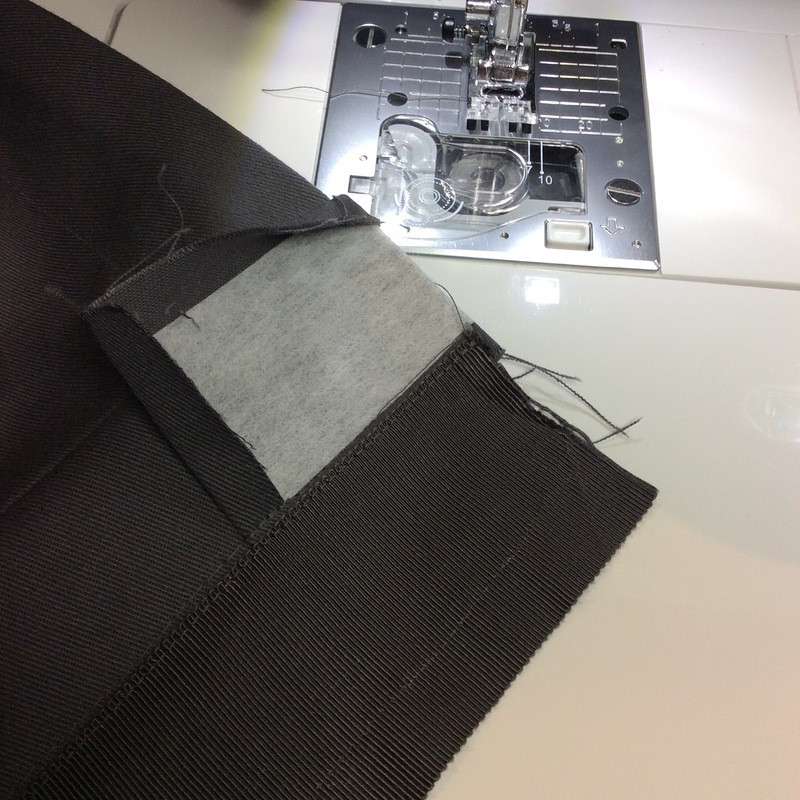 We are really loving your step by step about how to make pants. We are going to share your post in our channels this week. If any of your followers need woven labels, ribbons or hang tags, let’s help em out with a heads up for Black Friday this week as we will have a very special discount.